Supplementary material reads: "TWA Public Relations Dept., MIchigan 8141. Tuesday, August 21, 1951. 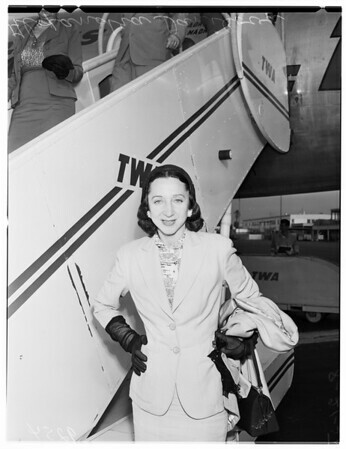 Alexandra Danilova, prima ballerina of the Ballet Russe de Monte Carlo, arrived in Los Angeles today via TWA Constellation from New York to join her company which is now appearing at the Hollywood Bowl. Danilova will dance during Thursday and Saturday performances and her expert skill combined with the other stars in the cast should prove a very profitable drawing card and further help the Bowl Fund".